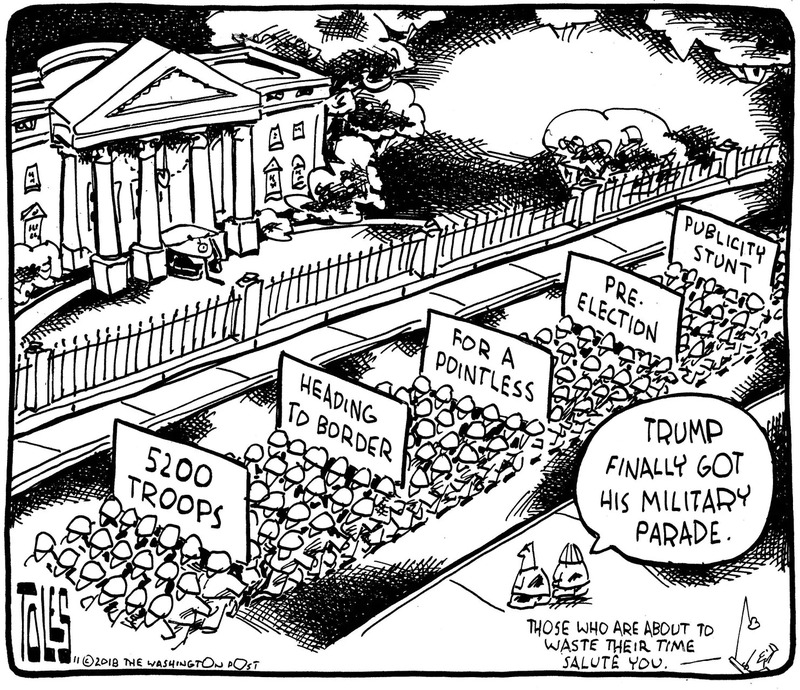 Note: Tom Toles is one of my favorite cartoonists. This is from the Washington Post. Trump later said he might send up to 15,000 troops to the border, when the caravan was 900 miles away, and the participants, many mothers with their children, looked very weary. Immigration is a hot button issue. There are a lot of folks, who are either unemployed or struggling with low paying jobs, who blame everything on immigrants, particularly Mexicans. Add a bit of bigotry into this mix, and irrational fears of the caravan approaching the US borders, and Trump has created an energized constituency that will vote straight Republican in the next election. What Trump can not do, nor any president, is take away any of our constitutional rights, through Executive Orders. 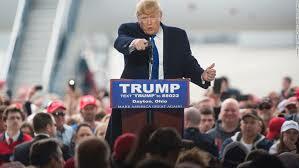 Headlines in CNN this morning, reads “Trump claims he can defy Constitution and end birthright citizenship.” Any executive order would typically be routed through the Department of Justice, and they would not give their blessing. An executive order is effective until a court issues an injunction. The injunction would happen very quickly. The Fourteenth Amendment states: “All persons born or naturalized in the United States and subject to the jurisdiction thereof, are citizens of the United States.” My guess is that Trump isn’t that stupid to sign such an Executive Order. It has succeeded. Trump wanted more media coverage. He sure as hell got it. It is only a desperation ploy, given early voting in the mid-term elections has started. There are billboards in Central America in the Northern Triangle countries advertising how to grab a kid to get into the United States illegally. Because that loophole is so big. Billboards,” Nielsen said during a July 19 interview with NBC’s Peter Alexander at the Aspen Security Forum. Politifact labels her statement “false” as there has been no evidence of any billboards. The US during the Obama administration, did help support billboards to help prevent illegal immigration, not promote it. See link at the bottom. The qualifications for asylum are based on the rules of Immigration and Naturalization Services (INS). Trump doesn’t have the authority to unilaterally change the rules. The Department of Justice, and AG Jeff Sessions will be involved in any changes. The courts will likely decide if it is within the executive branch’s authority to make changes. The false claims on the caravan are too long to discuss all of them. The caravan has existed since 2008. The people are poor. Many are women with children. Many are fleeing gang violence in their countries. George Soros, a billionaire and strong Democratic supporter, is not funding the caravan. In fact, just about every claim against Soros, spread through social media is untrue. The mid-term election might turn the House of Representatives to Democrat. That’s what this heated rhetoric on immigration is about. At this point, Trump would light a school bus on fire if he could get an extra 5 minutes of air time. And distract the electorate from horrible policies – ranging from pulling out of the Paris climate accord, eliminating many rules governing clear air and water, and the attempted elimination of health care for Americans with pre-existing conditions. Unfortunate there will be a slew of more lies as we get to Nov 6. VOTE! Kirstjen Nielsen falsely says there are billboards in Central America on illegal immigration. A “horrible law” requires that children be separated from their parents “once they cross the Border into the U.S.” Donald Trump, May 28, 2018. Here’s the truth from Politifact. But there is no law that mandates separating children from their parents. Trump’s own administration devised a policy to that effect. So what is Trump talking about? Whenever parents are charged with a federal misdemeanor (entry without inspection in this case), or awaiting trial, they are placed in the custody of the U.S. Marshals Service. Children cannot go to jail, so they are transferred to the custody of Health and Human Services’ Office of Refugee Resettlement. They are then placed with relatives, juvenile detention centers or foster care. That’s a longstanding Homeland Security policy, DHS told us. Before the Trump administration, immigrants entering illegally as families were rarely prosecuted, said Sarah Pierce, an associate policy analyst of the U.S. Immigration Program at the Migration Policy Institute. Instead, immigrants were held in family detention centers until they were sent to appear before an immigration court or deported. Attorney General Jeff Sessions announced on April 6 the Homeland Security Department would now be referring all illegal border crossings to the Justice Department for prosecution. Facing criminal charges, parents would go to detention centers, leaving their children unaccompanied. It’s the decision to prosecute parents that is causing the separations. “That’s a choice they have made that’s largely different from what other administrations have done,” said Peter Margulies, an immigration law and national security law professor at Roger Williams University School of Law. When we asked for evidence of policies separating families, the White House referred us to items determining what happens to unaccompanied immigrant minors. But none of the children in question would be deemed unaccompanied if the Trump administration did not decide to prosecute their parents. The 1997 Flores Settlement Agreement, for example, calls for the release of unaccompanied minors to family members or sponsors who can care for them as their immigration case is resolved. The Trafficking Victims Protection Reauthorization Act of 2008, which Trump has wrongly called “a Democrat rule,” determines that unaccompanied minors be transferred to Health and Human Services custody. The White House argued such policies encourage parents to send their children into the United States, knowing they will be promptly released. “The cruel and inhumane open borders policies of the Democratic Party are responsible for encouraging mass illegal migration, enabling horrendous child smuggling, and releasing violent MS-13 gang members into American communities,” White House deputy press secretary Hogan Gidley said in an emailed statement. The Trump administration may believe that Democrats are responsible for policies that encourage illegal border crossing, but we found no law mandating that children be separated from their parents. I know this is a hot issue. This blog is narrowly focused on historical and recent removal statistics. Here’s my conclusion – Trump in 2017 will likely deport the same or slightly fewer immigrants than Obama did in his last year. I know this seems contrary to the general impression that Trump is far more aggressive against illegal immigrants than Obama. I will explain why. President Obama record of deportations is shown below based on the ICE website. There is an upward trend in deportations, peaking at 409,000 in 2012, then declining to 235,000 by 2015. I’ve rounded the numbers for convenience. The deportations in fiscal year (FY) 2016 are basically the same as 2015, at 240,000 removals, or an average 20,000 deportations per month. The blue bars are the non-criminal removals. The priority shifted during Obama’s administration to target removals of illegal immigrants with a criminal convictions, as the blue bars become smaller percentages of the entire bar over time. The decline in removals from 2012 to 2016 is likely attributable to a reduction of immigrants coming through from Mexico. Security barriers including extension of the security fence and electronic surveillance likely discouraged immigrants or at least made the crossings much more expensive. There is a network of “coyotes” operating in many countries, such as Brazil, Guatemala and Nicaragua which organize illegal entries into the US, and my extremely limited polling indicates the cost is rising, costing as much as $10,000. News of increased border enforcement can discourage illegal entry. Therefore, it should not be interpreted that a decline in removals means that enforcement is lacking. The blue line is for “interior removals” (away from the border or near border towns) and is represents the Obama’s efforts to target immigrants with criminal conviction records. I don’t have a breakdown of these offenses, but they likely include fairly minor offenses. Probably, if Trump’s policies are working as he claims, the interior removals of immigrants convicted of crimes would rise above 60,318 in 2017. The best estimate I have at present is 202,000 removals for 2017, which will be about 14% below 2016. 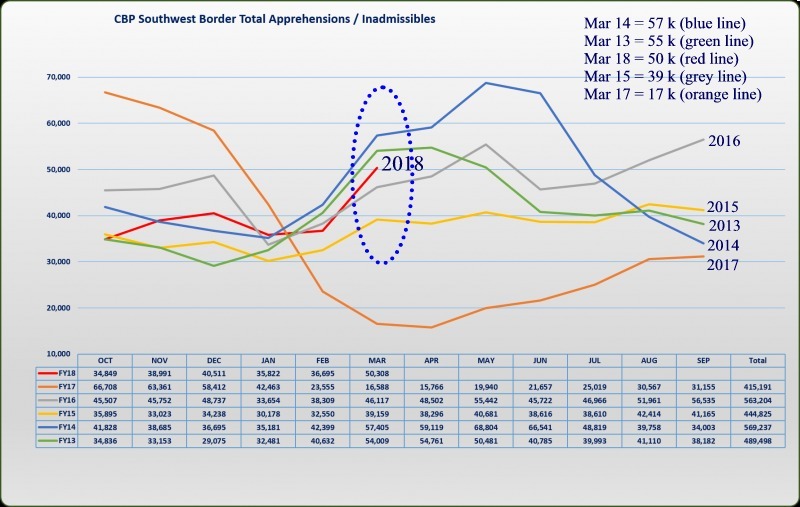 This would not be any fault of enforcement, but rather a decline in border crossings. Separating fact from fiction will be challenging. Messy. Immigration policy is always messy. This case is messy. Obama’s order did not legalize anyone, but deferred deportation for a small fraction of immigrants here illegally. It is estimated that it applied to 400,000 of the 11 million illegal immigrants. The question is whether President Obama has this authority. The Obama administration is on the defensive because the Texas court says he doesn’t have this authority and this caused a temporary halt to the program. A future president could rescind this order. Illegal immigrants who qualify get the all important green card, with alien registration numbers, just like permanent residents. So, opponents of the order argue that this simply promotes illegal immigration to this country. However, new arrivals or anyone coming after 2010 are excluded from this order. Many will not qualify because of a lack of documentation showing that they were here in 2010. The outcome could go 4-4, 5-3 or even 6-2, with Roberts and Kennedy joining with the liberals. But, many observers seem to go for the 4-4 verdict, which is a win for the states suing the government and an end Obama’s executive action. Obama’s executive order included the words “lawfully present” for people here illegally. It was argued by the Solicitor General the executive order might work equally well without these 2 words. But, attorneys supporting Texas, insisted the order allowed people to be lawfully present, whether it was explicitly stated or by the rights created by the order. I guess the SC has the option of striking down the entire order because it is simple contradiction of the legal status of these immigrants, and beyond the authority of the President to change. But, the executive branch has the obligation to carry out the laws passed by Congress- not enact laws to their own liking. So, this is the basis for Justice Kennedy’s comment that the executive order turns policy making upside-down. This comment coming from Justice Kennedy gives experts the feeling of a 4-4 decision with Justice Kennedy siding with conservatives. Thus, the argument that Obama’s executive order runs counter to the wishes of Congress is strong. Another problem is whether Texas can show grounds for bringing the lawsuit, based on the financial harm of having to provide driver licences to all the “legally present” immigrants. There was extensive discussion on this point. Texas has a law in place permitting driver licences to those in the “deferred status” category, so they would be financially burden unless they changed their laws in which case they could not sue the government. Chief Justice Roberts aptly called this a Catch-22. Liberals seemed more receptive to the argument that the realities of the immigration policy, 11 million illegal immigrants, and funds be sufficient to deport a fraction of these immigrants, so prioritization is within the right of the executive branch. The Solicitor General Donald Verrilli opened with this observation, but Justice Sotomayor brought it up again during questioning. The case will likely be a critical one, as this order is seen as an expansion of the authority of the president particularly among Republicans. It is seen as a pragmatic solution to a Congress deadlocked on immigration reform among Democrats. An Executive Order is not a law, but a temporary measure- but once immigrants get their deferred status, I honestly can’t see any future president wanting to rescind this order.